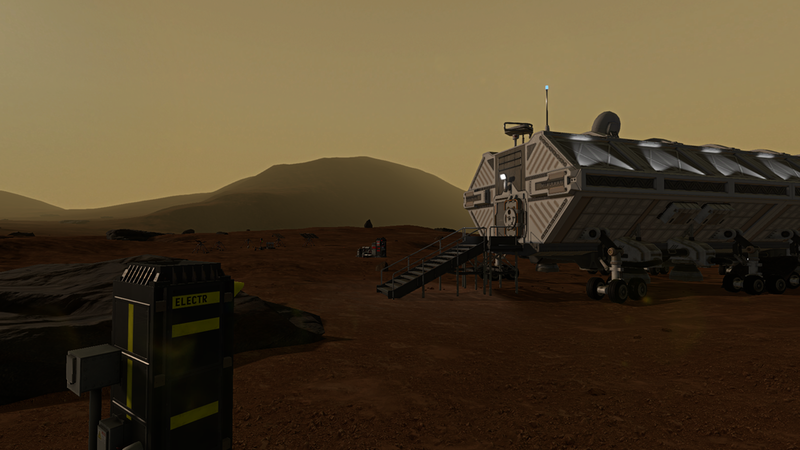 v0.61 focuses on a complete update of the power management system for exterior habitat modules, but a bunch of bug fixes are included as well. Check the change log below. Fixed incorrect east hab map marker location. Fixed datapad UI navigation issue that would discard inputs that were entered too quickly. Fixed bug that prevented you from strafing while auto-walking. 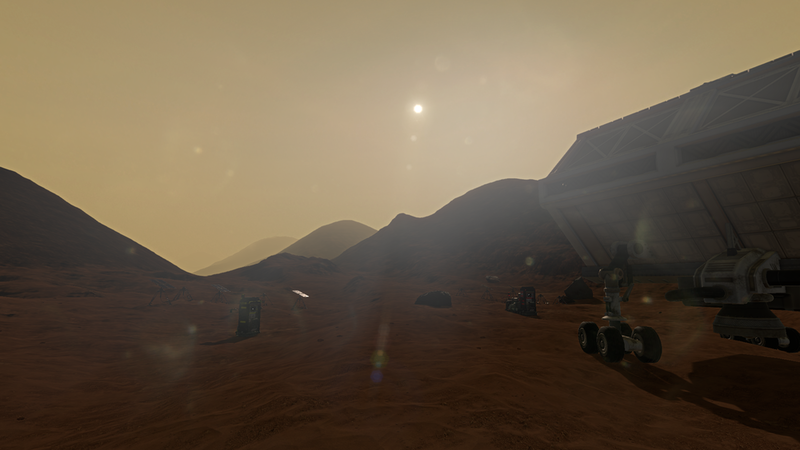 Fixed bug that caused dust storm effects to be visible and charging with portable solar panel to be possible while inside east hab airlock. Made change to WayStat discovery view colliders so that they hopefully trigger more reliably. Made change to mouse sensitivity range (this may require you to adjust your sensitivity in the control options menu). 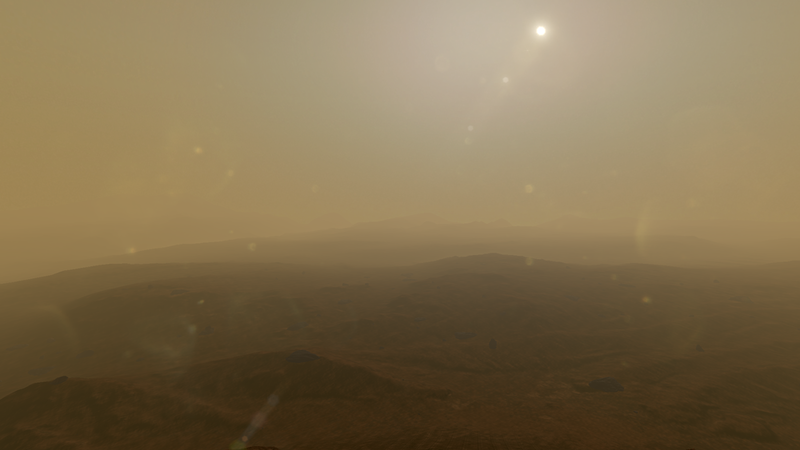 Fixed bug causing the minimum solar charge during a dust storm to go lower than intended. Game performance should be slightly improved after doing a recent optimization pass of several game systems. Reworked the entire power supply system for the habitat exterior modules. Read below for details. If you want a TL;DR of the new power system: We have moved from power percentages to power units. As long as you maintain 100 power units worth of solar panels/RTGs connected to each exterior module you should see very little difference to how the system worked previously. If you want a more in-depth rundown of the new system then keep reading. RTGs generate 50 units, day and night (used to be 100% power). Large Solar Panels generate 50 units during the day (used to be 50% power). Small Solar Panels generate 30 units during the day. Portable Solar Panels generate 20 units during the day. There are still only the 5 solar panel slots and one RTG slot for each module, but now they all contribute directly to the reserve battery so long as the electrical module is operational. However, now there is a maximum of 100 charge units from any set of module slots. That means the most you can generate during the day would be 400 units from all four modules. Then, all the modules also incur a general cost that pulls from the reserve battery in order to operate. 50 unit cost to produce water. 40 unit cost to keep water running if tanks are full. If at least 50 units are being supplied by solar panels/RTG directly connected to this module then water production is more efficient. 50 unit cost to produce oxygen. 40 unit cost to keep running if tanks are full. If at least 50 units are being supplied by solar panels/RTG directly connected to this module then oxygen production is more efficient. 50 unit cost to heat up interior to normal temp. 40 unit cost to keep running if at stable temp. If at least 50 units are being supplied by solar panels/RTG directly connected to this module then temp will increase faster if below normal temp. 25 unit cost to keep all electrical systems running (lights, crafting, etc). From the above requirements, the highest possible unit cost to keep all systems running would be 175 units, but if all oxygen and water tanks are full and the interior temp is stable then the cost would only be 145 units. This means that you should be banking between 225 and 255 units if you have the full 400 units of solar panels connected to your modules during the day. That banked amount should then be more than enough to cover the cost of all modules over the night and leave you with extra to transfer to your EVA suit when you go out to explore. Because of this new system, all modules now produce at the same rate during the night as they do during the day. This is a change from before when the Reoxygenator and Water Reclaimer would produce at a drastically reduced rate at night. To balance for the increased amount being produced around the clock, both of these modules now produce at about 60% of their previous maximum production rate. Many of these changes were prioritized based on feedback provided by players on our Feedback Forum[lacunapassage.userecho.com]. Help me determine future development priorities by posting your ideas, suggestions, and bug reports there. A special thanks to Mr. Fusion on the feedback forum for all his help and suggestions related to the power system rework. 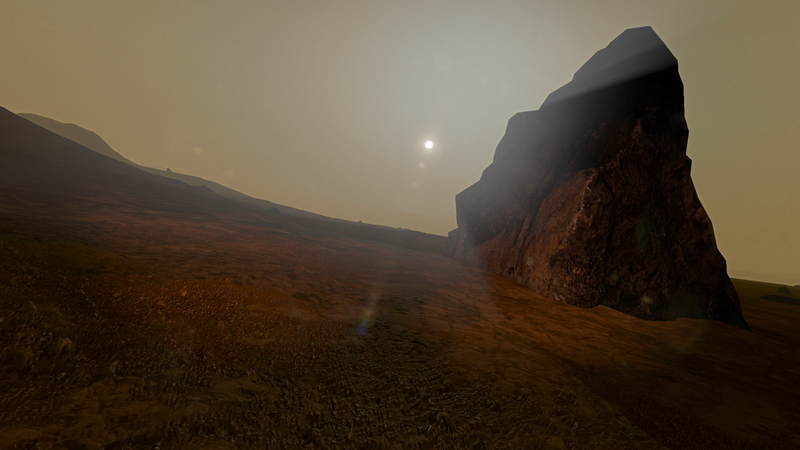 We are getting very close to a backer release for the testing of the Survival Sandbox mode. I'm going to get into my development progress since last month, but first I wanted to give a little more detail about how the rollout will work for the backer release. First off, the release will be managed through the Humble Store download pages that you claimed with your Kickstarter email address. This will not be done through Steam just yet. I haven't gotten to Steam integration yet, so to start with all backers will need to download updated builds through the Humble Store download pages similar to how you downloaded the old demo for Lacuna Passage Prologue. This rollout will happen in waves according to your Kickstarter Backer reward level, with Beta level backers and above getting access first. I'm only one developer, so I can't handle large numbers of bug reports and requests all at once. We will gradually rollout access until all backers are included. Then we will work on bug fixing, planned feature additions, and requested feature additions until I think we are ready to launch on Steam Early Access. I will then transition to Steam integration and all backers able to access build updates automatically through Steam. If some of you don't want to worry about encountering excessive bugs or having to manually update your build then I would suggest that you wait until I am able to add Steam integration before you try the game. These are practically complete, but since they are inherently random, I want to filter out any bugs that may be difficult to track down if they are bugs that sometimes occurring during random storms for some players and not for others. This might seem like an odd omission, but I would like to focus early bug reports to the first 1-2 hours of gameplay. Early build updates might break game saves anyway so I want to avoid that at first. Since these provide a temporary shelter during storms and a place to save your game while on an EVA, there is no need to include them if those other features are not in place. Early backer builds may be noticeably absent of most audio and music. This is partly to save filesize for early build updates, but I also have just not had the development resources to focus on these aspects yet. They will be improved before the Early Access release. One of my contract artists and long-time contributors to Lacuna Passage, Jeremy Brown, is nearly complete with what I hope will become one of our most iconic assets - the EVA suit. So far only the high poly and low poly models are complete and already I think it looks great. It should look even better soon when the textures are finished. Jeremy has also completed a wonderful new flag asset that I have applied cloth physics to, allowing it to react to our wind direction and intensity. I've also begun the final lightmapping process on the habitat interiors. I've completed Habitat Alpha which you can see below. 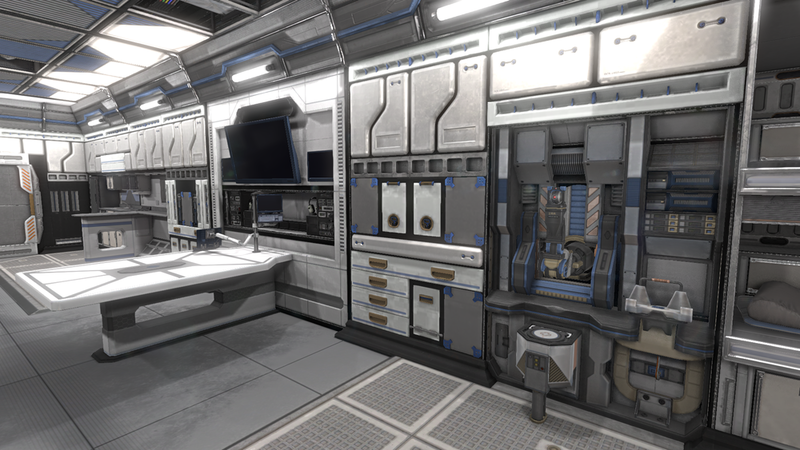 I have two more habitat arrangements to complete, but all that consists of is essentially just rearranging the modular interior wall segments and rendering new lightmaps. This will help to distinguish the three discoverable habitats from each other while exploring the interiors. I can also report that all 92 randomized discoverable locations on the map have been placed and the container contents of each location are being randomized on each new playthrough. 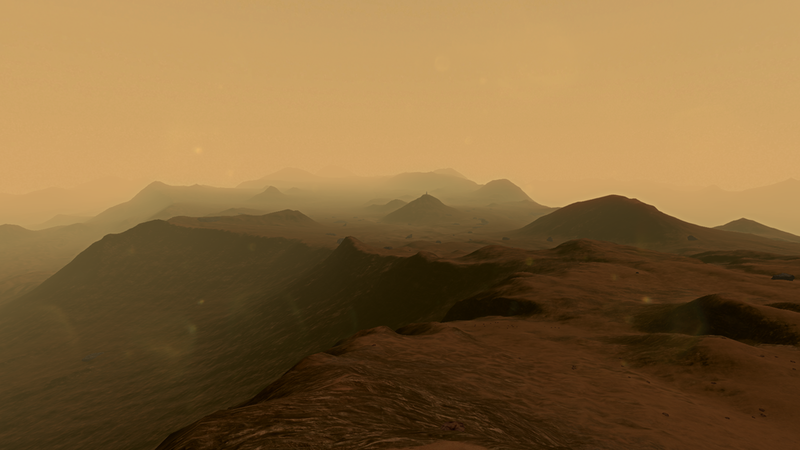 On top of all that I have punched out dozens of tiny bugs and added many quality-of-life improvements. None of which would be super exciting to describe here, but I've personally been testing the game lately and it's honestly starting to feel like a very compelling gameplay loop. All-in-all, things are going great. Development progress has continued at a steady pace despite my wife and I working hard to prepare for our first child, and hopefully I can get our backers access to build downloads without much more delay. Hang in there! I don't really have a good intro for this month, so... Inventory icons! They're pretty cool. I've been staring at placeholder numbers on the inventory screen for so long, so it's actually really exciting to finally have some finished art in the UI. The above images show the current 25 completed icons, but we should have roughly 100 total items in the first Survival Sandbox release. 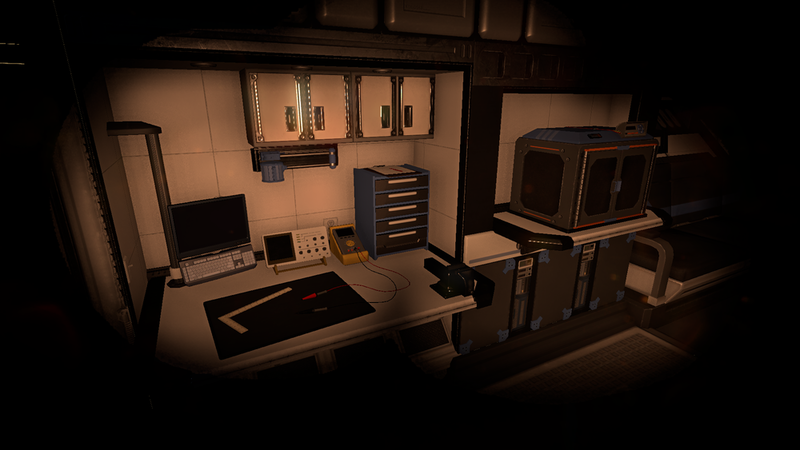 I've also been working on several more integrated features between our habitats and their attached exterior modules. A simple addition of a new habitat status console in the airlock will allow you to quickly check all of your life support systems at a glance. This will help you to make a game plan before you decide to exit the habitat for an EVA. Keeping tabs on your oxygen, water reserves, power and heat status will be very important. As you can see above, this is a habitat that was just recently brought back online. Power is on and your reserse suit battery is being charged. The airlock is currently depressurized, but the interior temp is quite low still since the heater was just turned on, so it's probably best to let it get up to a comfortable temperature before entering. Most importantly, your water reclaimer seems to be offline. In this scenario all of the modules have been turned on, but it seems like there must be a component failure in the water reclaimer preventing it from collecting water. Which would be bad enough on its own, but unfortunately the reoxygenator also requires water to produce oxygen and with the water reserves empty it can't do its job. So you can see how this screen will be very helpful in evaluating any issues that might arise. The next step for our astronaut in this case would be to go on an EVA with some carbon filters, hoses, fuses, and maybe a circuit board in order to repair any component failures in the water reclaimer. This kind of situation might be exactly what you face after finding your first habitat to take shelter in after starting a new Survival Sandbox playthrough. But before you get to your randomly selected starting habitat, you will spawn at a randomly selected landing site in an emergency landing pod. Eight of the 9 total habitats are possible starting habitats and each habitat currently has two possible landing sites which makes for a total of 16 possible starting positions for any one playthrough. A while back I showed some of our new rock and cliff models that I will be using to spruce up the landscape a bit and I've been slowly adding many unique formations to the terrain. Below are a collection of screenshots showing the new level of terrain detail with these added models. Alright, that's it for the devlog this month. There's more that has been completed, but not much that would be fascinating to share right now. So back to work! This past month has been a lot of coding and very little asset creation. Which means that this month's update will not be that visually interesting, but it also means that we are getting to a very good spot with the development of the Survival Sandbox. And when I say we, what I really mean is I. I am the only full-time developer on the project right now and I handle a few other small contracted contributors. My brother Spencer who was working as our full-time art director has moved on to other employment since we have reached a point in development where a majority of the remaining work is not art related. He is still assisting with a few art tasks, but for the most part we are moving forward and looking ahead towards our release on Steam Early Access. We have made mistakes in our development and hit unseen roadblocks that have set us back multiple times. We apologize to our followers and to our backers. Thankfully we are reaching the release horizon. A few months ago we put out a Development Roadmap that you can view to check our progress. But today we want to take that a step further by sharing our current release goals. Our hope is to have the Survival Sandbox released to our backers by the end of the year and available on Steam Early Access by April of 2017. Since we are such a small team there is certainly a chance that something could come up that would prevent us from hitting our release goals, but I am doing everything in my power to deliver. No one wants you all to play the game more than I do. So, that being said, let's talk about what I've been working on to make that happen. A huge part of the Survival Sandbox mode will be providing randomized gameplay so that players will have a highly replayable experience. In the past we have discussed some of these randomization details and this month I've finalized some of the time consuming aspects of the habitat randomization. I have just completed placing every solar panel mount, every habitat exterior module, every cabling flag, and every habitat support wheel. The status of every equipment component is now being randomized. Each of our nine habitat locations is now integrated fully into our randomization system. Only three of those nine will be spawned for any specific playthrough. Below is a collection of screenshots that highlight the variety of terrain that surrounds each of the nine possible spawn points. I am also working on the randomization of all the elements you will discover on your journey. Like I mentioned last month, I won't be sharing a lot of details about these discoveries since we want there to be an element of surprise for players, but I will show just a simple look at the tools we are using to fill these locations with interesting items for you to manage in your inventory. I won't get into the technical details, but you can see how we are working within randomization constraints to provide a compelling replayable experience. In the coming weeks we will be randomizing the interior of the habitats and filling in all the various discovery locations with interesting things to find. 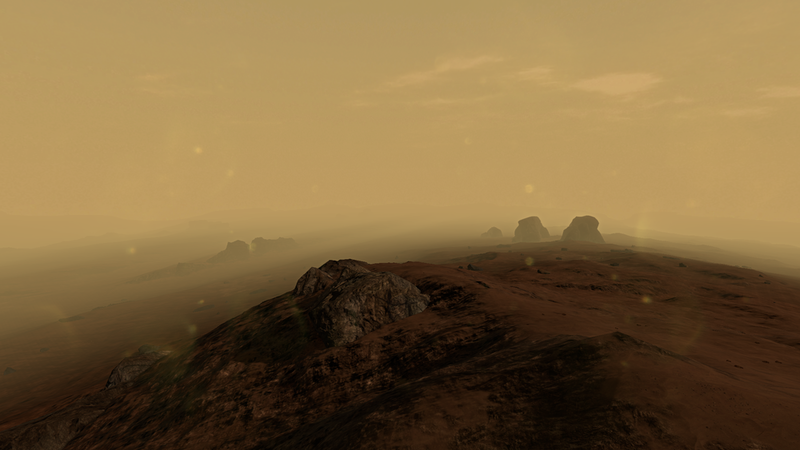 Ultimately our goal is to provide a game that let's you experience a view of Mars that comes as close as it might feel for our first planetary explorers. And we really can't wait until you all get a chance to play it. Thanks for hanging with us. We have put a lot of work into the exterior modules this last month. So let's cover each one and how they will impact your life support systems in the habitats. The water reclaimer and reoxygenator are very closely related. Both require many of the same components to function and their output is connected. Here you can see the circuit board, pressure pump hoses, and just below that are the fuses. As with all components in the exterior modules they have the potential to fail. Above you can see an obviously broken fuse. Broken components can be replaced, but the slot it's in will need to be repaired as well. If a diagnostic had been done on the above module the slot damage could have been identified and repaired before the component failed. Unfortunately now the fuse is lost. Every broken component has a visual identifier. Above you can see how the hose on pump number two has lost pressure and is no longer pumping. Carbon filters are important for both the reoxygenator and the water reclaimer. Above you can see a broken filter, a functional filter, and a third empty slot. Not all slots must be filled with working components. Some can be inserted purely as a backup in case another slot fails. If all components of the water reclaimer are functional it will slowly produce water from the soil which can be accessed as a resource in the habitat storage under the "Consumeables" category. I mentioned that the reoxygenator and the water reclaimer are tied, and that is because you can't produce oxygen on Mars without H2O. If the reoxygenator is functional it splits the H2O from the water reclaimer and extracts the oxygen. Above you will see the tanks that can store water and oxygen. Each module has their own tanks. However, if the water reclaimer breaks then the water remaining in the tanks will be slowly depleted to produce oxygen. Of course if you have multiple oxygen tanks you could always turn off the reoxygenator to preserve your water supply. Or perhaps if you have multiple water tanks installed then you will have plenty to spare. Of course, new storage tanks can be crafted... so long as the hab has power. The electrical module only covers the interior and exterior lighting in the hab, power to the crafting bench, and the recharging capabilities for your suit battery. Each module has its own power supply (solar panels or RTG) for their own respective functions. All doors can be manually operated so you will never be locked out even with no power to the electrical module. Above you can see how the exterior lighting is affected without power, which might be a navigational hinderance if you are trying to find your way back to the hab at night. Inside you can still rely on your flashlight to get around and access your storage or sleep in a bunk. If you're afraid of the dark you could always salvage some components from other modules to keep the lights on and then move them back when you don't need to be inside. One unique component of the electrical module is the simple electrical wire which you can see in the image above. The heater's one unique component is the heating element. Above you can see that they are positioned similar to the carbon filters on the water reclaimer and the reoxygenator. If too many heating elements are damaged or missing then you will definitely start to feel the chill inside the habitat. The interior temperature will slowly decrease over time to match the freezing Mars temperatures outside the hab. Although, as long the electrical module has power you can keep your suit battery recharged and stay warm inside your suit. As you can see, the exterior habitat modules are a vital part of your life support system in Lacuna Passage. Your suit may be your first line of defense during an EVA, but the habitats are an oasis in the vast Mars desert where you can plan your next move. You must keep a constant inventory of all the required components so that none of these important systems breaks down at an inopportune moment. In other news, our game TIMEframe is coming up on its one year anniversary of release and is currently on sale for 50% off in the Steam Summer Sale! If you haven't had a chance to check it out yet, now is a great time. If you already received your free copy as a Lacuna Passage backer, consider picking up a gift copy for a friend. And please leave a review! Hope you all have a wonderful 4th of July here in the states and thanks for reading! I'll have plenty for you to read about this month, but let's start out with a video instead. We've been working on our survival sandbox randomization features and that includes the random placement of 16 different Waypoint Stations around the map. Check out the video below for more info. Having these early randomization features in feels great, but we have more than just WayStats being randomized. We recently completed an early test for full habitat randomization, including exterior/interior transitions which you can see in another video below. Last month we gave some details about how these habitat locations are randomized, but now we actually have them physically represented on the map along with loading transitions to randomized interiors. This is a big step towards being able to test our new "Survival Event" system. "Events" will form the backbone of our survival sandbox game mode for Steam Early Access. We've shown how the physical components of the map can be randomized and remixed for each playthrough, but with our events we will be able to randomize the gameplay as well and keep the player on their toes. Those of you who have read or watched The Martian will know where we are trying to go with this system. The intent is to surprise the player with many "mini-disasters", but to hopefully make the player feel like they have just the resources they need to solve the problem if they think quickly. If you watched our previous devlog video about crafting items then you will have a better understanding of how these events will be "fixed". Similar to how you might craft items, the survival equipment in the game may have components that break and need to be replaced. Some materials might be useful for crafting and for equipment repairs, so you will need to ration your supplies carefully and choose which items might need to be broken down for their component parts. Space is an unforgiving place, so you will have to face increasingly difficult challenges the longer you survive. If you haven't had a chance yet, you can check out our previous art devlog to see some of the equipment that you might be tasked with repairing. Thanks again for following along with us on our blog. Come back in a few weeks for more progress! Sorry for posting this a day late, but the wonderful and confusing tradition of the Iowa Caucuses put a wrench in my plans to post yesterday. This month we have been adding some crucial features to our Survival Sandbox mode, including the brand new unique map. We wanted the Survival Sandbox mode to stand on its own with a different map built specifically to maximize replayability. Most importantly that meant creating a map that has entirely unique terrain formations. We are happy to say that this map is nearly complete. 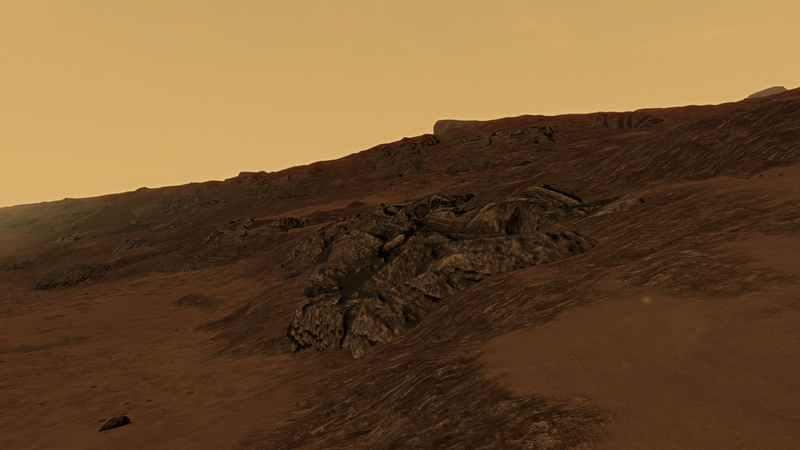 We still plan on adding more large rock formations that are not pulled from the NASA satellite data. Generally we like to lean more towards realism, but many of our sourced heightmaps are fairly sparse. Mars is incredibly geologically diverse on a macro scale, but on the micro scale it is mostly flat and empty. So while the following screenshots do have a decent amount of variation we will still add lots of cliffs and larger formations to fill in the gaps. We are happy to say that this new map is exactly the same scale as the one we will eventually be using for the story mode. Nearly 25 square miles. This gives us a ton of room to work with for some randomization features that will be largely unique to the Survival Sandbox. The Pink labeled dots are potential habitat locations, nine in total. Every time you play you will start near a different habitat around the outer edge of the map. There will be three habitats spawned for each playthrough, but we use an algorithm to ensure that they always form a natural "path" across roughly one third of the total map area. In Survival Sandbox mode it is likely that you will need to make your way from one habitat to the next after you run out of supplies, so this placement algorithm should help keep the same map feeling fresh with a different path every play through. The Red labeled dots are our Waypoint Stations, 16 in total for each playthrough. These are important navigational checkpoints that help you in many ways we will be detailing later, but as you can see in the sample randomizations above they don't always appear in the same locations. The Dark Blue labeled dots are currently referred to as our "Primary Objectives". Each objective will be unique, but they all function as a sort of "oasis" in the vast Mars desert. They are carefully positioned hubs that can expand your overall search radius when found. 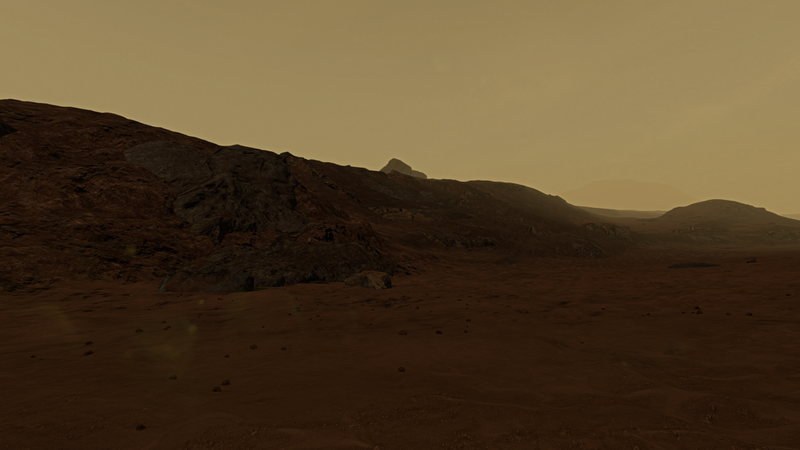 One example might be a broken down rover that contains an oxygen refill tank and a battery for recharging your suit. As you can see above, we use another algorithm here to ensure varied placement of Primary Objectives. The Light Blue labeled dots are what we call our more general "Points of Interest". These will be our most heavily randomized objectives on the map. They are smaller and less important than Primary Objectives, but the more you find the more likely you are to maintain your extended survival on the red planet. These might be emergency food storage caches, downed weather balloons, geological research plots, or any number of other mission-related sites. 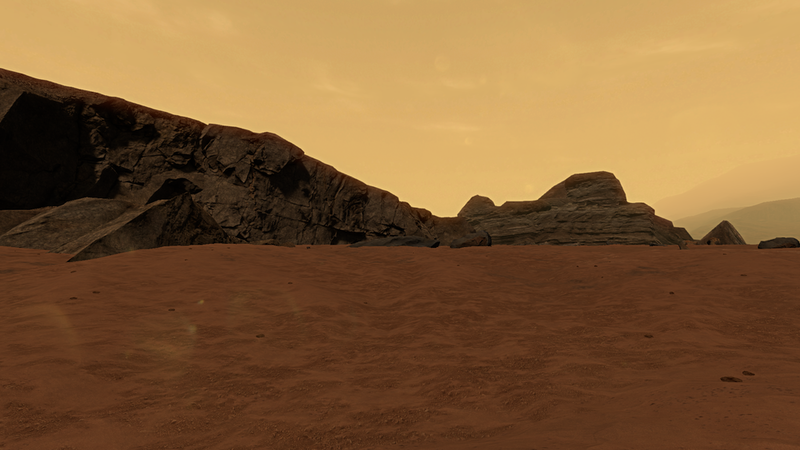 In general, the quantity and frequency of the sandbox map objectives may be greater than what you might expect in a real Mars mission, but we feel very good about the variety this adds to the gameplay and the real sense of discovery you get when stumbling upon these locations. As you can see, our Survival Sandbox mode is not entirely procedural, nor is it entirely static. We are using light randomization features to add variety for replayability. We are applying this method with our habitat interiors as well. There will be nine possible habitat interiors to match our nine possible habitat spawn locations. So, even if you happen to spawn at the same habitat location on the map, the interior of that habitat may not be the same as it was before. Since each of these nine interiors are still designed by hand it allows us to have a higher fidelity for the art and especially the lighting. We have reintroduced the use of lightmapping to have the most realistic rendering possible. Below you will see our first pass at using our new lightmapping and reflection probe setup. You might also notice a few shots where we have managed to swap the lightmaps to simulate a power outage which you may encounter on your mission simulation. Next month I hope to be able to share some details about our "survival event" system which will effectively serve as your primary antagonist for the Survival Sandbox mode. We really want you to feel like Mark Watney dodging curve balls left and right that might drastically impact your chances of survival on Mars. Creative problem solving and resource management will be key to overcoming the odds. If you have any questions let us know in the comments! The Bridge is complete and fully integrated with Unity 5. 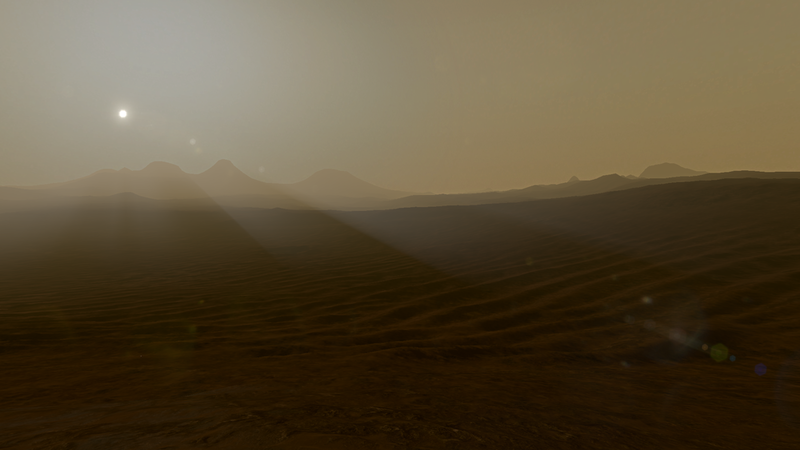 We have been working hard to update our assets to the new Unity standard shader, and we really think it has paid off. Our workflow is more streamlined than ever with the use of physically based rendering (PBR) and real-world material properties. We have always utilized the Quixel Suite to tweak our normal maps and create base textures, but only recently were we able to make use of Quixel’s built in PBR map generation thanks to this new shader in Unity 5. We start by creating a base model and high poly for normal mapping. Then we transition to Quixel’s nDo for normal map tweaking. This allows us to make normal map changes within Photoshop using custom shapes and selections. Once we have our normal map complete, we create a color map, or ID map, that separates the different material sections for our final textures. Quixel has a color swatch dedicated to each of their base materials, so we simply find the material we want using our own custom material previewer in Unity and apply the proper swatch to that area of the color map. Next is where the magic happens. Quixel's dDo then takes all the information from our normal map and color map to generate base diffuse, specular, and gloss maps accurate to their real-world counterparts. If you're wondering what the Bridge will look like from the exterior, check out the last art devlog post here. You may notice that the Bridge is made up of a plastic similar similar to that of the Greenhouse. The frame and supports are designed to be suitable for variance in the terrain and flexibility. The central hub that forms the intersection of the Bridge serves as a pressurized dock for the PRT (Pressurized Roving Transport). Eventually there will also be attached docking bays for smaller remotely operated scout rovers. There is still a lot of work to be done on this piece, but we are quite happy with the look so far. We hope to have the Bridge complete and textured by the end of the month, so be sure to check back next month to see what comes of it. Lacuna Passage - Devlog #45 - See you at PAX East! Lacuna Passage still has a ways to go before release, but we thought it was important to stay visible and get early feedback from players in a public forum like PAX East and we are honored to have been accepted into the MEGABOOTH. The new demo we will be showing is not like our old Prologue demo. This is entirely new content that will eventually constitute the introduction sequence of the final game. It is roughly 15 minutes of gameplay that gets you acclimated to the world, game controls, and narrative hooks. Obviously this is something that we have been touting for a long time. 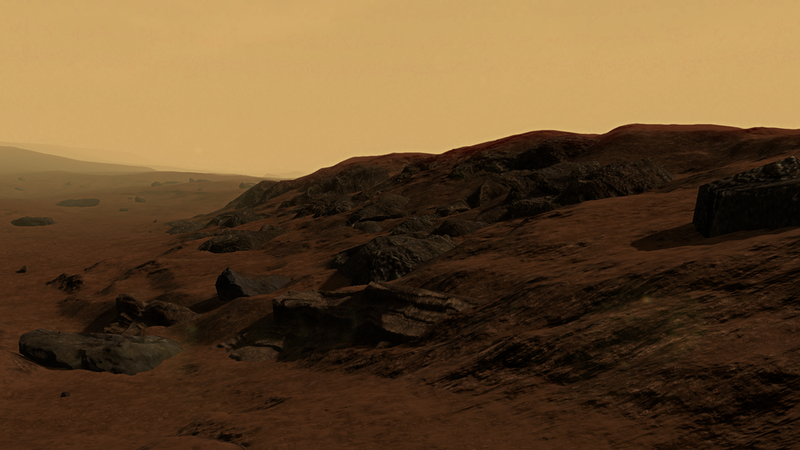 The open exploration of Lacuna Passage with accurate Mars terrain has been one of our biggest selling points, but until now we haven't really shown it in a playable form. The original Prologue demo was only a fraction of what we had planned for the total terrain and now with our PAX demo we will be showing off something much more representative of the final game. The total explorable area now is still only about 1/4th of what the full game will be, but this is mostly for narrative reasons in the early game. The old Prologue demo only had small bits of intro and outro music. This time around we are actually scoring the narrative beats during gameplay and it feels great. A lot of credit goes to our amazing composer, Clark Aboud. You can expect to hear more soundtrack previews in the near future. For all of our game music we are now utilizing our Song Seed music plugin for Unity which we will hopefully be putting up on the Unity Asset Store soon after we return from Boston. We have been posting screenshot updates of the Foundation Base Habitat for quite some time now and at PAX we will be sharing these playable interior areas for the first time. Our lead artist Spencer Owen has been working insane hours to get everything ready for the show. The most exciting aspect of the Hab though will be the official introduction of IRA, Jessica's AI companion. There are countless other minor improvements that we have made in the last month or so. We have added a new wind system that dynamically affects all blowing dust and our weather monitoring station instruments. We have a new night sky map that has more accurate star placement and an impressive visible milkyway. There's really too much stuff to go over in one blog post. If you want to check out the new demo you will have to come visit us in booth 6181 in the Indie MEGABOOTH next weekend!